An easy cookie that is gluten-free, paleo and vegan. Plus, they taste amazing! Preheat the oven to 350F and line a baking sheet with parchment paper. In a large mixing bowl stir together the almond meal and tapioca starch, then add in the rest of the ingredients. Stir well until a sticky, uniform dough is formed. At this point, you can drop the dough by tablespoons onto the pan and flatten them with your fingers. (The dough is very sticky, so you might want to wet your hands with water to easily press the dough.) These cookies spread just a little bit, not a lot, so try to shape them into the size you want them to turn out. Alternatively, you can freeze the dough for 30 minutes and then roll it out on parchment paper to create cookie-cutter shapes. Sprinkle the dough with extra arrowroot to help prevent sticking to your rolling pin, and dip the cookie cutters in arrowroot, too. Roll the dough into 1/4-inch thickness for cookies that are firm on the outside and soft in the middle. The thicker your dough, the softer the cookie will be in the center. Bake the cookies at 350F for 12 to 14 minutes, until the edges are dry to the touch. The browner the edges get, the crispier the cookies will be, so I pull mine out before the edges brown at all. (But, I like mine pretty soft in the center.) You can play around with your baking time to get your desired texture, but keep in mind that these cookies will firm up even more as they cool. Allow the cookies to cool on the pan completely before frosting, at least 30 minutes. To make the Honey Buttercream, combine all of the ingredients in a small bowl and squish them together with a spatula. 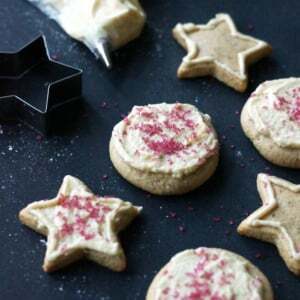 This frosting will not harden like traditional sugar cookie icing, but it should spread easily and not melt at room temperature, thanks to the use of shortening and arrowroot. Spread the frosting on the cooled cookies, or use an icing bag with a decorating tip to pipe it around the edges. I also used a few naturally-dyed red sprinkles (this company uses beet juice for coloring!) to bring these festive cookies to a holiday party last night. They were a total hit!